Robert Eugene "Bob" Richards (born February 20, 1926), nicknamed the "Vaulting Vicar" or the "Pole Vaulting Parson" in his competitive days, was an American athlete who was known for pole vaulting in the Olympics. 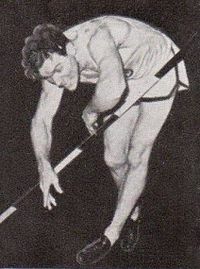 He competed in the 1948 (where he won a bronze medal), 1952 (gold medal), and 1956 Summer Olympics (gold medal) as a pole vaulter, and as a decathlete in 1956. Richards was born in Champaign, Illinois. He studied at the University of Illinois at Urbana–Champaign. This page was last changed on 1 April 2018, at 22:42.